Most of the commands I send to SIM800C module returns ERROR message to me. If I sent AT+CSQ, it returns an expected response. 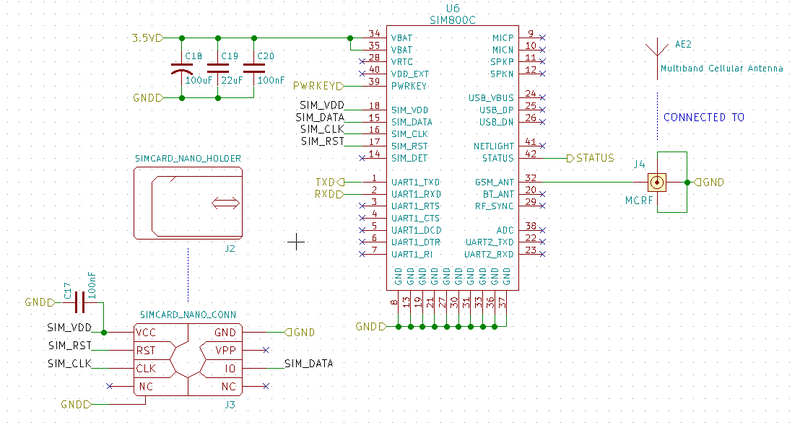 One of the basics commands that doesn't worked for me is the AT+CPIN? PIN checking command. In the datasheet, I don't even can find the possible cause for this error. Among many explanations for the problem, I found one, and I don't remember which was, that said to send a command to expand ERROR in details. As result from AT+CPIN?, I received a error that corresponds to "no card inserted" and I don't know why. The SIM card works fine, I have tested on my phone. The SIM card is not detected by module. I measured the voltage in the card bus and I have 0 volts. I don't know it is the cause or the consequence for bad functioning, not even it is related to this main problem of this question. The problem was bad contacting between SIM card contact block and the board. The problem was difficult to find because when I touched the terminal for measurement it makes pressure to the board, the contact happens and the problem couldn't be observed. Are voltages on card correct? Can bus signals be seen in a scope? Is SIM card contacts block footprint correct? Is card in the correct position? Are SIM card VDD and GND both connected? After eliminated most of all those questions the only possibility was the last one. Fact! I touched GND in the card holder very very delicately and the problem was there, a Heisenbug. I hope this answer and checklist help a lot, because information about this kind of problem is very difficult to find. You can enable extended error reporting, by sending AT+CERR. Different devices will give different informaiton, but you should at least get some diagnostic help/hint. the last unsuccessful GPRS attach or unsuccessful PDP context activation, the last GPRS detach or PDP context deactivation. Typically, the text will consist of a single line containing the cause information given by GSM network in textual format. Not the answer you're looking for? Browse other questions tagged hardware mobile-data gsm or ask your own question. How to transmit binary data over CIP using AT commands? How to trigger a function in SIM800C Module using an SMS from AWS IOT?